Supernatural needs to lighten up. At its best, the show understands that dire circumstances don't always mean misery; the Winchester chemistry and the series' willingness to indulge in flights of self-referential fancy can help make even the darkest hour bright enough to bear. Plus, for all its angsting, this isn’t a serious drama at heart—it’s a pulp-fiction horror show, with gore and monsters and terrific one-liners. But these past few years, Supernatural has become increasingly dour as the stakes for our heroes rise, and while for the most part, I’ve enjoyed the show’s ambition and expanding scope, there’s a certain point at which painting everything black becomes a matter of self-indulgence rather than good storytelling. 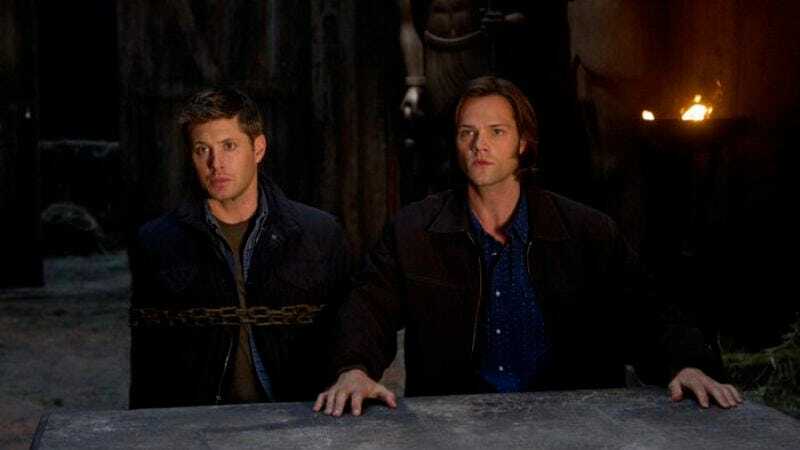 After a strong start, this season is slowly teetering over the edge of that brink once more, and tonight’s episode, which has Dean struggling with his guilt at the worst possible time, seemed to bring everyone one step closer to giving in to despair. But we had a hopeful ending, at least, and while I’m not sold on a lot of “Defending Your Life,” the parts of it I did like gave me more hope than the end of last week’s episode. About last week’s episode: Dean killing Amy was a bad move, both for the character and for the show itself. Once again, his black-and-white morality reared its ugly head, and once again, one of the brothers now has a secret that could threaten their friendship if it ever came out. It’s been eight seasons now, and the whole, “Monsters have to die, even if they’re trying not to be monsters!” line has run its course. So it’s interesting to see this week that the ramifications of what Dean did are still lingering, although it’s arguable that he’s more guilty over lying to Sam than he is about murdering a mother in front of her child. Even more interesting is the way the Monster of the Week plays out. The Egyption god Osiris in is Dearborn, MI, of all places, picking up strangers in bars and bringing them back to a barn for judgement. If they have more guilt in their hearts than the weight of a feather, Osiris pronounces a death sentence, and the unfortunate soul is tracked down and murdered by a representation of his worst sin. In the cold open, we see a guy getting run down by a car in his tenth floor apartment; turns out he killed a girl while driving drunk. Another guy gets torn apart by a dog in a restroom—he ran a dogfighting ring. Supernatural has done “monsters who punish the guilty” before, but what’s different here is each of Osiris’s victims show clear contrition for what they’ve done; and while that contrition is necessary for the god’s punishment to take effect, what isn’t necessary is the fact they each man has used that guilt as a push towards bettering their lives. Admittedly, going to AA meetings after you kill a kid while driving drunk isn’t exactly balancing the scales, but it’s more complicated than a simple scumbag getting what he deserves. And the guy who ran the dogfighting ring actually spent the last few years of his life working to help canines. The implication being that people can change, despite Dean’s fervent wishes otherwise, and that’s a direction I wouldn’t mind this show heading down more often. Of course, that would call Dean’s behavior last week even further into question, and while he probably should be held accountable for what he did, I’m not sure the show could really survive getting too deep into it. He does eventually get picked up by Osiris tonight, and we do get a trial (with Sam serving as his lawyer), but, since Dean isn’t ready for Sam to know what happened, and the show isn’t ready either, Osiris instead brings out the ghost of Jo to make Dean feel bad about himself. Then he calls Sam to the stand. Fun as it is to see Jo again (hey, remember when she wasn’t dead? Those were good times), this isn’t a particularly profitable tactic from a dramatic standpoint. We know Dean isn’t responsible for Jo’s death (they talk about her father a lot, but wasn’t her mom a hunter too? ), so instead of addressing some real issue that requires catharsis, it’s just a series of toothless interrogations that let Dean off a hook no one ever really thought he was on in the first place. There are a few grace notes here. As I mentioned earlier, buried under a lot of backstory repetition, it’s great to see a slightly more complex view on guilt and human nature than the show usually offers. While I hope we get back to snarky Dean soon, watching him get buried under his shame over his behavior over the course of the episode worked pretty well, and it’s always nice when Ackles gets to do more than just frown a lot. I thought his last scene with Jo was especially nice, although I’m not sure I understand why she’s the person he felt most guilt about. Maybe Osiris just sends the ghost most likely to make you feel like crap. And the last conversation between Sam and Dean was refreshingly angst-free. Yeah, Dean still hasn’t come clean about Amy, and I’m dreading that shoe dropping, but Sam is actually laid back and fine with the world. Going through Hell has given him a new lease on life, and that’s a nice bit of writing there; Padalecki is getting as much chance to expand his range as Ackles lately, and it’s working out well. While I’m sad the show has given up the intensity that powered its first two weeks, I’m hoping that Sam’s optimism may rub off on his brother in the weeks to come. And for god’s sake, let’s not have anyone stab anymore Firefly alum, okay? Big thanks to Carrie for filling for me last week. Just wish the episode hadn't been so much of a bummer. The title for this episode is also the title of a great Albert Brooks movie. And since you all are AV Club readers, I’m sure you already knew that. It’s nice that Jo isn’t vengeful during her scenes with Dean, not even when she’s getting ready to kill him on Osiris’s command. Man, I miss when this show wasn’t just three dudes against the world.